The record winning player of the EHF Champions League history will receive an award for the best line player of the 20 years of the premier club competition. 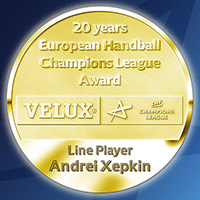 No player has ever achieved anything like Andrei Xepkin in the history of the EHF Champions League. The Ukrainian-born and Spain-based legend of European handball won seven titles in the continental top flight and will remain the most successful player of this competition for at least another season. During the VELUX EHF FINAL4 in Cologne he will receive the award for the best line player of the 20 years of the EHF Champions League. ehfCL.com: You have retired several years ago, but your awards are still piling up. What does this nomination mean to you? Andrei Xepkin: It's an honour for me that I have been named for this team. It's a big thing for me now that I have stopped playing. ehfCL.com: You will come to Cologne to receive the award on the fringes of the VELUX EHF FINAL4. And two of your former clubs are not only going to compete there, but they are the favourites to meet in the final. What are your predictions for this potential duel? Andrei Xepkin: If Kiel and Barcelona reach the final, I think Barcelona have a 51 and Kiel a 49 per cent chance. But my heart will always beat for Barcelona. I played here for so many years, and now I work here. ehfCL.com: Has your relationship to Barcelona been always so strong? Andrei Xepkin: When I signed for Barca, I did not know anything about the club. So when I came here, it was absolutely suprising and I am still discovering this club every day. And now I know that it is the best club in the world. Barcelona is better than Bayern. ehfCL.com: You won six titles of the EHF Champions League with Barcelona, five of them in the ninetees. What was the special secret of that golden generation which won this competition five times in a row? Andrei Xepkin: The secret of the team in the 1990s was the team itself. I always say that I was lucky to be part of that team. We didn't have any star players and we didn't need any because we had a great team and we also felt the responsibility to be successful because we had this great club, FC Barcelona, behind us. What thrived us was the absolute will to win. Everybody had that. ehfCL.com: However you added your last title with Kiel in 2007. Why did you leave to Germany after so many successful years in Spain? Andrei Xepkin: I think that every handball player that wants to see everything in handball has to play in Germany. I have always joked that I wouldn't know the colour of the seats in the Ostseehalle (now Sparkassenarena). The perception of handball in Germany is different compared to Spain. I played for several months with Kiel – it was incredible. Every match there was a full hall. It was a great experience. But I still love Spain. I love Barcelona, for me it is the greatest club in the world. ehfCL.com: You continue to work for this club even after your retirement. What are you doing currently? Andrei Xepkin: I've been coaching the young Barcelona team for four years now. I like this job very much. The next year I will also help the best young players who have the opportunity to make the step into professional handball and into the first team. I demand a lot of my players, but I can also be very funny. I am enjoying very much coaching these young kids. For me it is a fiesta every day. ehfCL.com: With so many successes under your belt it has to be difficult to pick out just one or two best moments of your career? Andrei Xepkin: The EHF Champions League victory against Kiel in 2000 and the victory with Kiel in 2007 were the highlights of my career. They were beautiful. I won the EHF Champions League many times, but I have to say I would like to win one title in Cologne at the FINAL4. EHF Champions League winner in 1996, 1997, 1998, 1999, 2000, 2005 with FC Barcelona, 2007 with THW Kiel, Olympic bronze medal in 2000, EHF EURO sliver in 1998, EHF EURO bronze in 2000 – all with Spain – World Championship silver in 1990 with the Soviet Union.